Today’s Chocolate Ginger Cookies recipe is from Kristin. She fell in love with these cookies at the Four Seasons Teddy Bear Christmas Tea, and was brave enough to ask Naomi Gallego, the Four Seasons Pastry Chef, for the recipe. I made a half batch today, and as I read the ingredient list I was a little surprised to see that the Chocolate Ginger Cookies recipe didn’t call for eggs. To be safe, I checked the Martha Stewart Cookie Book which features a very similar cookie on the cover. Martha’s recipe didn’t contain eggs either, so that’s good news for those of you with egg allergies and vegans. As for the cookies, they were excellent and despite all the ginger, not overpoweringly gingery. I left out the crystallized ginger and used 2 tablespoons fresh ginger instead. Also, cook time in my oven turned out to be more like 9 minutes. Chocolate Ginger Cookies bake quickly! Kristin’s recipe is here. I didn’t make any changes other than those mentioned above. Hooray! I need to make these again. Oh my GOODNESS these were amazing!!! I would have ignored Santa too. I really recommend finding the crystallized ginger, because it adds a wonderful texture and flavor variation. Hi Bee, it’s on the link that says “Here”. Here’s the link. Where is the recipe? It is not on this page. PLEASE post it. It sounds wonderful. Cream the butter and the brown sugar in a mixing bowl until light and fluffy. Slowly add molasses scraping well after each addition. Sift all of the dry ingredients and add them along with the chocolate chips and crystalized ginger bits to the bowl and mix until just combined. Store the dough in refrigerator for at least 4 hours, over night is better. Scoop about a tablespoon full of dough and roll in the palms of your hands until perfectly round and compact. This is super messy, but so worth it! Roll the rounded dough balls in sugar to coat and place on baking sheet. Bake until puffy. These cookies are best when slightly under baked. After several attempts to determine the perfect baking time, 5 minutes yielded the perfect cookie for my taste. Note: One of Mrs. Kravitz’s Littles was here the day I made a test batch of these cookies. He says the dough is just as good as the cookie. And, he had enough of both to be considered an expert. This particular recipe doesn’t have metric measurements on it, but maybe I can help. 2 sticks of butter = 8 oz which = 230 grams. You may or may not recall me emailing you about the gingersnaps from Whole Foods (last year, oh so long ago!!) I am in love with these (and any/all gingersnaps) but especially the texture of these. Anyway I noticed that at http://www.davidlebovitz.com/ he was on much this same pursuit and seems to have succeeded! I am so excited I can hardly wait to get home to make these. In any event, I thought I would pass this along to you. I will let you know how mine turn out, but David is pretty spot on with whatever he takes on, so I feel certain these will be good! As always, keep up the great work you do with this site. Love it! Oh, Anna, thank you! I’ve never made ginger cookies for Christmas and I was determined to do so this year. These seem to be perfect! Lara, they are really good! I think next time I might try Martha Stewart’s. Kristin, I leave off ingredients all the time. Anyway, luckily you didn’t! This is a great recipe and since it’s egg-free it should be easy to make vegan. …..so Veggiegirl can make them ;). Dawn, I was a little hesitant to make these but the chocolate/ginger combo was really good. Catherine, good for you for asking for recipes. I have no idea how chefs feel about that. I guess some like it and some hate it. I never even thought to go find the chef and ask for a recipe. Two of my favorite flavors! What a great recipe. I love it that it has no eggs, because I’m always discovering that I have none, when I start a cookie dough! That is awesome she went right up to the chef! Props! I do that all the time. Sometimes I get tossed right outta the kitchen! Oh well, no pain, no gain! oh those so good. 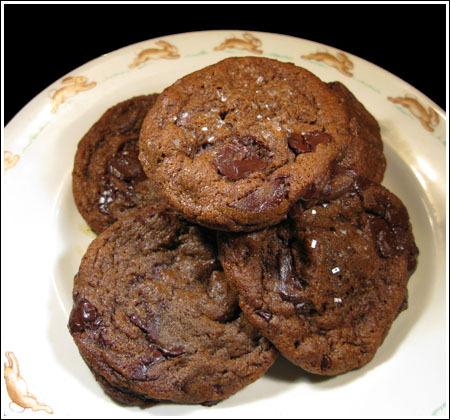 I have never made a chocolate cookie with ginger…sounds like a great pairing. mmmmm! Those look like must-bakes to me!